For the first time in 10 years, Doctor Who has broken its tradition of putting out a family friendly hide-behind-the-sofa. The show’s writers decided to skip the Christmas Day staple in favour of a New Year’s Day slot, which is a risky move considering how quintessential the Christmas Day episode were to festive telly. Because of how much of an impact Doctor Who, including the Christmas specials, had on my childhood, I was skeptical of the move away from the traditional December 25th slot. I was ready to strongly dislike this special episode; however, Chris Chibnall and the other show runners managed to win me over. The story starts with a bit of lore about an fictional historical battle against an unnamed foe. An archaeological dig uncovers part of the foe’s remains, which are magically resurrected by UV light and hitch a ride on innocent bystander Lynn (as played by Charlotte Richie), in a style that reminds me of the bug on Donna Noble’s back from the Tennant era of Who. But there are more throwbacks to come, when the super-powerful unnamed enemy from the dig site is named; Dalek. 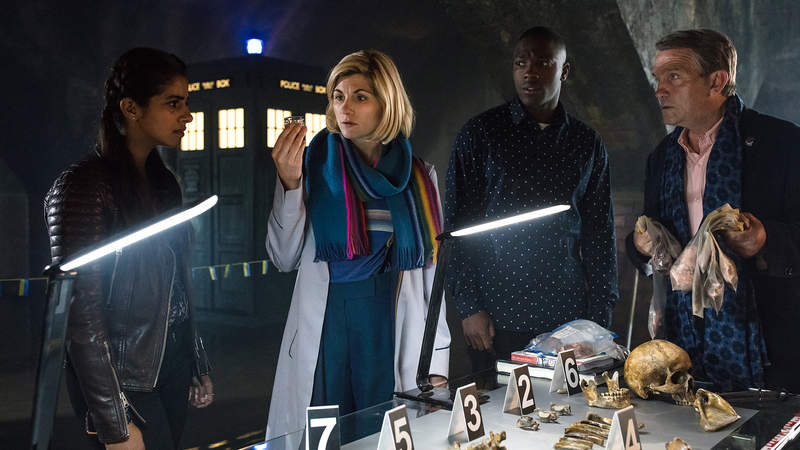 This is the first time this season that there has been an old-school Who villain, as Chibnall, lead writer, had stated that they were trying to avoid classic aliens in the new series featuring Jodie Whitaker. I thought they would carry that through to this New Year’s episode, however I was very much mistaken. The announcement of a Dalek stopped me in my tracks and I was shook. Chibnall had managed to keep me watching when I was about to call it quits on this Doctor Who special. The plot spiralled out of control from there, with a predictable New Year’s romance between the two archaeologists, and Ryan’s family issues tying this episode down to reality. I did feel they bit off more than they could chew, as there wasn’t much for the companions to do, and it felt like the ‘Jodie Whitaker and Dalek Show’. I did feel a little disappointed at the fact that, with such a formidable enemy, they tried to weave too much humour into it (such as the U.N.I.T Helpline sketch). When dealing with the iconic enemy of the entire Doctor Who franchise, that has such a reputation, surely it would be better to focus your entire energy into stopping the Daleks, rather than quick quips and one-liners, and flashes to random scenes (such as the broken wi-fi scene that was not needed at all). It felt like they were just trying to fill time to make it up to the whole hour, where we could’ve had more action scenes with the Dalek. It left me wanting more, and if they had spent less time making jokes and more time fighting Daleks, it would have been a better episode overall. However, I was very glad they decided to resurrect the Daleks for this special episode, and wish I could’ve seen more. On another note, the soundtrack for the episode was intense, and used with such brilliant timings such as the arrival of the Dalek, or to close the show. I hope they bring back the Daleks for Season 12, which is due to premiere early in 2020.